What is happening? Black blood continues to ooze, pump, and explode into the Gulf. B.P., the Coast Guard, and the U.S. military are powerless to stop its wave of utter, incomprehensible destruction. Bigger than the Exxon Valdez spill. 100,000 or 200,000 or 500,000 gallons a day for going-on three weeks; an amount we will never be able to imagine. Canyons of crude death. Generations of flora, fauna, and ecosystems erased. Gone. For good. Does it take an engineer to explain why sucking the marrow out of the earth is a deadly process? 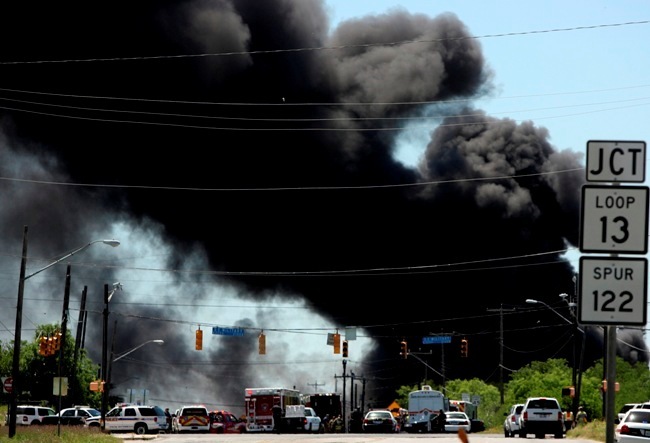 Now, today, a tanker truck exploded at a San Antonio refinery loading dock. Firefighters are struggling to control the blaze, spending most of their efforts to prevent the fire from spreading to the jet fuel and diesel storage facilities. Fire Chief Charles Hood does not sound optimistic. The coal mine explosion in West Virginia. The coal carrier crash at the Great Barrier Reef. The burst pipeline in the Louisiana National Wildlife Refuge. The BP platform explosion and leak – the most devastating fossil fuel catastrophe in decades, perhaps ever. The TVA Kingston slurry damn failure just over a year ago in Tennessee (one of the worst disasters in history). The dozens of other “minor” accidents involving the harvesting of coal, oil, and natural gas. And, now, today, here in Texas, the latest explosion in humanity’s mad pursuit of 19th century fuel. What does it all mean? Why do these things keep happening? What are YOU going to do about it?